Written by Industrial Heritage dot ca. 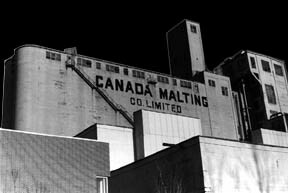 In 1928, the opening of the Canada Malting Company (CMC) marked the arrival of the first grain shipments to the harbour in nearly 20 years. The CMC is considered an important example of the Modernist maxim "form follows function"; this design actually influenced the thinking of European Modernist architects. It was also considered a milestone in the history of Canadian civil engineering technology. Abandoned. With a description like that, it's hard to imagine that at one point in time, the very spot I stood was once a buzz with activity. A hellish roar would have prevailed as machines churned; intense overhead lights would have cast an irritating glow upon the surrounding mechanical labyrinth. Every time I venture into one of Toronto's many abandoned industrial buildings, these thoughts always cross my mind. It seems absurd that somewhere in the past, these places were home to hundreds of workers, for decades at a time, 365 days a year. Some large board of directors dedicated their lives into constantly upgrading and streamlining their operations, hoping to make their plant the best it could be. Now it's all gone, and the empty and neglected monuments stand as reminders to all of us that everything comes to an end. Whenever I see a new building being constructed, I always wonder when and why that building will meet its fate. Wrecking ball? Implosion? Or perhaps a condo conversion? All those months of backbreaking labour will end up in a pile of rubble. As in life, too, I suppose. Chaos always wins in the end. The derelict Canada Malt plant in Toronto lies right next to the Toronto Island Airport ferry dock at #5 Bathurst Street. I had driven by this massive structure (most notably its huge 150' silos) many times, and finally decided to go in for a closer look. Why does this building still stand after years of vacancy? Because it is a historical landmark in the eyes of the city. There was talk a while back about converting the Malt Plant into a music hall of fame - which would have to be the largest waste of money since the Skydome. With the grain trade growing in North America in the late 1800s, a demand was created for more efficient grain storage facilities. The elevators of the 19th century were constructed out of wood and brick, with wooden interiors. Due to the explosive nature of grain dust, silos back then only had a life expectancy of 12-15 years. The search for fireproof materials with high tensile strength lead to research which found concrete to be the material of choice. The last standing 19th-century wooden elevator was destroyed by fire in 1908, which put the grain trade in Toronto on hold. In 1928, the opening of the Canada Malting Company (CMC) marked the arrival of the first grain shipments to the harbour in nearly 20 years. The CMC is considered an important example of the Modernist maxim "form follows function"; this design actually influenced the thinking of European Modernist architects. It was also considered a milestone in the history of Canadian civil engineering technology. The site was expanded in 1944 due to the increased need for war-purpose alcohol and food supplies. The CMC silos are made up of two separate but adjacent modules: the silo unit, and the germination-kiln unit. There are four components that make up the silos: the original 1928 silos and head house, the 1944 silo extension and the marine leg. The original silo component contains 15 grain storage bins and stands 120 feet high, while the 1944 silo extension contains 14 bins and stands 150 feet high. Smooth, uninterrupted poured-concrete walls can be seen in this section, representing an advance in construction technology over the 1928 section. Here, the cylindrical shapes of the bins can be seen from the exterior of the silos. In order to refresh my memory, and to take photos for this article, Ninj and myself revisited the site. We discovered that getting in is a lot harder than it used to be. Security has been beefed up a fair bit; all the old plywood walls covering access holes have been replaced with new, 10' barbwire fences. Getting in now requires a little trick involving some water rescue gear that can be found on the pier close by (these items should be put back -- both for safety reasons and avoiding suspicion). If you've ever watched McGyver, you'll figure it out. Bring an old blanket for the barbwire, too. Those who want to avoid climbing over barbwire in the wide-open area that faces the water on the south side (frequented by police cruisers looking for a quiet spot to do their paperwork) can search for an easier entrance on the north side of the plant. When I first visited the plant at night with a group of friends (about six years ago), we had already discovered a way in during a prior day trip. With many trips over several years, I have seen nearly the entire place. Let me start by saying that this building requires you to always be safe, on your guard, and not goofing around (too much). This is by far the most potentially dangerous place I've been. Travel with a flashlight always -- even in daylight there are sections that are eternally pitch black. Bring a basic first-aid kit, Band-Aids, etc. Clothes that can get dirty or ripped should be worn. Wear long sleeves and a good pair of shoes, even hiking boots. There are many places where small bolts and pipes stick out of the floors by only a couple of inches - so watch your step! Bring work gloves, as almost everything is covered in rust. There is a constant, somewhat unpleasant smell of musty grain that fills the air, and there's lots of dust -- so take an antihistamine if you've got allergies. Pack some fluids, the climb up is strenuous. There are lots of openings in the concrete floors where there used to be massive duct systems, some of which are hard to spot in the dark - some drop several floors. There are doorways that will take you on an express trip to death hundreds of feet below, too - so take it slow and look before you leap. Most importantly, don't go alone. Once you've gotten passed the barbwire fence (and "No Trespassing" signs), you will find yourself in a courtyard that is surrounded by high factory walls. This area is somewhat well lit (at night), so beware of being seen by anyone beyond the fences. All ground level openings here have been bricked-up, so you'll need a way up. I suggest bringing a rope ladder if possible, as several areas here offer potential to those with climbing technology. If not, get your climbing gloves ready -- some kind soul has left a knotted rope dangling conveniently, leading to a 12' roof ledge. 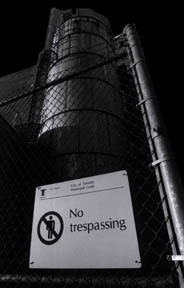 No matter how you gain entry, make note of your position in relation to the "tower", the highest structure of the plant. It is the key to getting to the top -- so get yourself there. 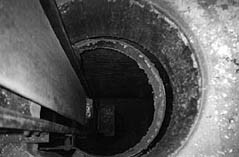 Inside the tower you will find the shaft for an old cage-like elevator. The other half of the shaft is inhabited by a wacky metal spiral staircase -- hop on and start climbing. If heights bother you, be warned that this staircase ascends the entire length of the shaft, probably 10 or more storeys. Only a single iron handrail provides protection. If you get tired or dizzy from going in circles (I've had eerie dreams of climbing these stairs), there are doorways at every floor where you can get off and explore some very cool rooms and derelict machinery. Keep in mind that these rooms are the areas where you may encounter gaping holes in the floor. There are many great views of the city skyline all the way up, too. 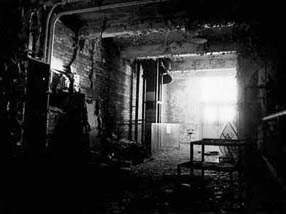 There are many old, decayed rooms to explore on the journey to the top. On your journey to the top, you can navigate your way to a large room that sits atop the silos. Large windows flank the room, making it very pretty at sunset. It is probably 60-70' long by 30' wide. 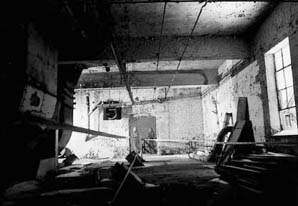 There are small hatches that open into the silos; so you can peer into their inky blackness. Even my D-Cell Maglite would not pierce the darkness enough to see the bottom. 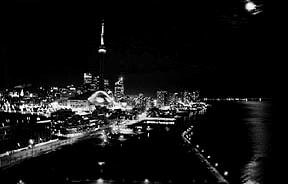 On one of our night visits we were startled by a circling helicopter, its searchlight beamed through the windows - then we realized there was a ball game at the Skydome - it was a TV crew. There is some cool machinery on tracks in here that once moved along the floor to pour stuff into each silo. You are probably about 20 storeys up here. Watch for bolts in sticking out of the floor. There are also a couple of fire escape doors that no longer have fire escapes attached to them - watch that first step! The Belt-o-vators provide a one-man elevator system. Another oddity on the way up are the "Belt-o-Vators" - I don't know what else to call these things. They are a system of one-man vertical human conveyor belts, running to each floor. There is a little platform to stand on; a worker would pass through each floor via a small opening in the floor and ceiling. A rope controls stops and starts. 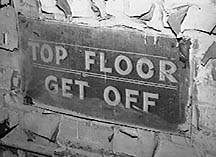 An odd sign at the top end of this system reads: "Top Floor-Get Off". If one chose not to take head of this warning, one would be squished through the rollers like in an old-fashioned Maytag - yikes! One flight before the spiral stairwell comes to an end, you have to get off and follow a corridor a short way north to a non-spiral stairwell. The stairs here are the metal-mesh type, so you can see through them as you climb. At this point you are about 3/4 of the way to the top. The stairway narrows, which means that you've entered the tower, the final ascent to the top. This is where my fear of heights started to kick in, since the stairs allow you to see many floors beneath you - just don't look down. I think it was worse doing this at night, because the chasm below was pitch black. If you brave the last few flights of narrow metal steps, then you will come to a little room at the top. The room is perhaps 15'x10', the actual dimensions of the tower itself. There is a small metal ladder that leads to a hatch, beyond which is the very peak of the Canada Malt Plant. There you will find a flat roof with 2 1/2' ledges around the edge. There used to be flashing red airplane warning lights on the roof, but last time I was there they were gone - I guess no one cares if a plane hits it. The view from here is second only to a helicopter - the skyline sprawls out before you. Now you crack open your beverage of choice and enjoy! There are dozens of other great places in the Malt Plant - "secret" rooms, catwalks, tunnels, ancient machines, kilns, etc. The whole place is like the wreck of the Titanic - early 1900's industrial technology encrusted with rust. Plan to spend several hours there, and play safe - maybe get a Tetanus shot before hand. The abandoned Victory Soya Mill at the base of Parliament Street (351 Lakeshore Rd. E.) is the sister plant to the Canada Malt Plant. The same company ran both, but the Malt Plant was built long before the Soya Mill. The Soya Mill was much larger than the Malt Plant, but it has been partly demolished so it's about the same size now. I was inside on a personal exploration long before the demolition. The Soya Mill is much newer looking, and for that reason not nearly as cool. Many sections of the plant still have working lights, unlike the electrically dead Malt Plant. Another not-so-cool thing is the fact that there was a constant security patrol there (unlike the Malt Plant). If you do visit, stick to the upper levels, where security doesn't go and don't make a lot of noise. The Victory Soya Mill was the sister plant to the Malt Plant. It was occupied by squatters until it was demolished in early 1998. The plant was constructed in 1944, and was owned by industrialist E.P. Taylor. It sits upon a 51/2 acre Port of Toronto site. At the request of the government, Sunsoy Products Limited expanded their operations to include manufacturing facilities to alleviate wartime shortages of oils and fats in Canada. Its location made it ideal as there is easy access to road and rail systems and it is bound by water on two sides. The Victory Soya mill was unusual because it combined the continuous screw press and continuous solvent extractor methods of processing oil-bearing materials. I wish I knew exactly what that meant. This article excerpted from "Toronto's Secret Castles," the full text of which appeared in Infiltration 7 (Dec 1997), together with a trip to an abandoned nuclear missile silo.